Patient safety is paramount! When patients receive a general anesthetic (GA) during surgery, their breathing must be assisted using an endotracheal tube (ETT), laryngeal mask airway (LMA), or other similar devices. During emergence, while the patient is becoming conscious, the breathing device must remain uninterrupted for the safety and health of the patient. Bite blocks are regularly used to protect the airway from the patient biting down and obstructing the airway device, biting their tongue, breaking teeth, or causing hypoxia. The purpose of the bite block in general anesthetic surgeries is to protect the patient during the procedure, especially as they are waking up from the anesthetic. The current bite block market contains an assortment of bite block products, including: hard bite blocks, airway covers, and hand rolled gauze pads. All these devices have major flaws. This bite block fits around the airway tube and is formed with a hard polymer, preventing any compression and thus protects the airway and tongue. The major problem with this device is that the force is placed on the patient's front teeth, which can hold much less force than the molar region of the mouth. The combination of a hard material with no compression and the bite force being placed on the patient's front teeth can lead to damaging the patient's teeth. This bite block fits along the tongue and settles in the back of the oral pharynx. This may cause retching and gagging in the semi-conscious patient. Again, the front teeth are positioned on the hard surface causing fractured teeth when the patient bites down or clenches during emergence from anesthesia. This hard bite block also causes mal-position during the use of a LMA. This is a simple cover for the airway tube. The cover is made of a hard polymer that prevents the airway tube from being obstructed. Again, a large force is placed on the patient's front teeth and damage can occur. A common solution to the hard bite block and cover is the use of gauze rolled soft bite blocks. These are produced by hand, on-site, by rolling 4-inch by 4-inch gauze pads and using tape to hold them together. This produces a cylindrical bite block 4 inches long and approximately 3/4 inches in diameter. The soft bite block is placed between the patient's molars to prevent the mouth/teeth from compressing less than the width of the airway tube. This prevents the damage to the patient's teeth compared to the hard bite block, because the material is softer, and the force is applied to the patient's molar and pre-molar teeth which can handle much greater forces. Currently soft hand rolled bite blocks have many problems because they are rolled by hand. This forces staff to waste valuable time, and the cost due to higher hourly wages is very expensive. Staff often produce the bite blocks in break rooms, lunch rooms, or at home, which expose the product to numerous allergens. The hand rolled bite blocks are inconsistent in thickness and frequently will compress to less than the diameter of the ETT or LMA. Often a number of bite blocks are stored in bulk storage bags on the anesthesia cart where multiple providers pull out a bite block. There exists many chances for contamination to occur and a potentially hazardous situation is created. The hospital becomes liable. As stated, current soft bite blocks are produced by hand. This results in wasted time for anesthesia providers, and an environment of allergens exists because they are exposed to many surfaces and hands. Hard bite blocks are hazardous to patients' teeth. This creates a demand for a quality product in the bite block market. Thirty clinical sites were surveyed. Of these, 80% stated that something should be used between the teeth during emergence. Of the 80%, 64% indicated they currently use a hand rolled bite block and the other 36% use a hard bite block, based on availability. Some practitioners use tampons in the patient's mouth. 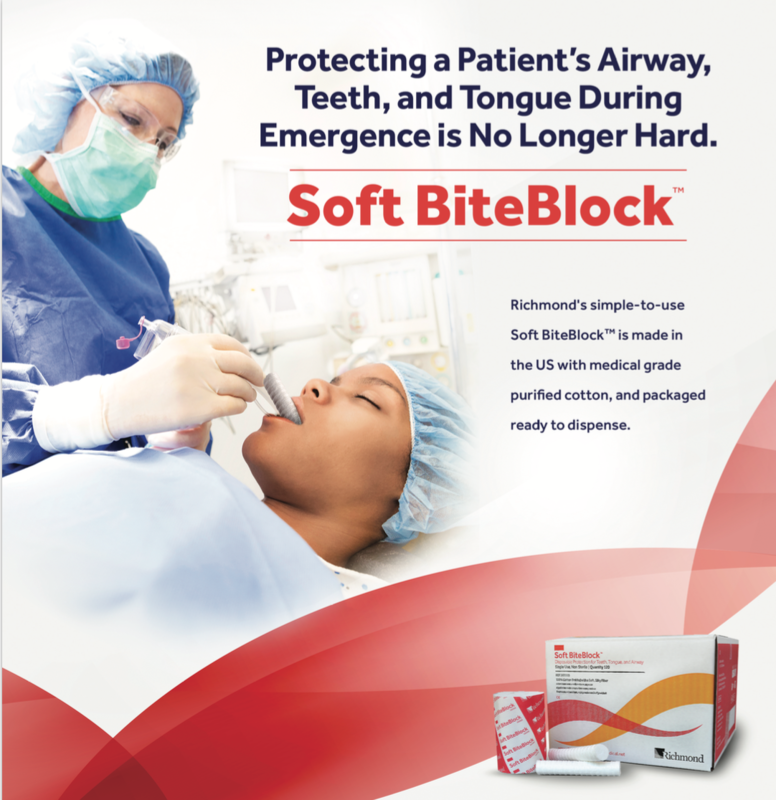 Richmond Dental & Medical has produced the first Soft BiteBlock™ that is commercially available. It is made in the USA with 100% purified medical grade cotton, and is a cylindrical shaped dense cotton roll wrapped with silky yarns. It is produced in a clean, controlled environment and packaged ready-to-dispense, making it readily available to the practitioner. The Soft BiteBlock™ has a consistent size and compression, is absorbent, and latex free. Research (North Dakota State University) results show that the Soft BiteBlock™ is consistently above the required diameter of 7mm (common adult size ETT or larger) which is 38% larger in diameter than the hand rolled bite block currently being used. The hand rolled gauze pads were found to be slightly below the accepted minimum diameter of 7mm and were inconsistently rolled by each practitioner. The Soft BiteBlock™ is placed on either side of the mouth between the back molars with the tongue medial, thus protecting the tongue and teeth. Richmond’s Soft BiteBlock prevents compression of the endotracheal tube and laryngeal mask airway. The Soft BiteBlock™ keeps the space between the front teeth open for easy suctioning of the patient's oral cavity. The Soft BiteBlock™ is inexpensive considering the cost of staff salaries, nosocomial infections, and lack of product availability in emergencies if hand rolled bite blocks are not prepared ahead of time. The Soft BiteBlock™ is also highly absorbent. To the patient, when using the Soft BiteBlock™, there is less risk for infection or allergic reactions, dental damage, tongue injury, or obstruction/collapse of the endotracheal tube or laryngeal mask airway. To the practitioner, there is assurance that the Soft BiteBlock™ is produced in a secure, FDA certified and clean environment. Time and salary are saved by using a consistent quality product. To the hospital, there is reduced legal liability from infections and allergic reactions, and less insurance claims for tongue and dental damage. Richmond Dental & Medical, a subsidiary of Barnhardt Manufacturing Company, Charlotte, NC, is the only manufacturer of the Soft BiteBlock™. It is produced in the USA with 100% medical grade cotton. The Soft BiteBlock™ comes in a uniform 4 inch size and will soon be produced in the 2.75 inch size. Patent is pending.